Last view: 69 days Zynk, if you want to look for Palettes or palette hex numbers for any weapon including for charged shots, use the FCEU's PPU viewer which is located at Debug. The bottom row of the 1st 4 bytes is Mega Man's weapon palette. Last view: 1922 days So this is thee 8bit Megaman hacking thread? Anyone know of a MM wiki for all this hacking info? Anyway, I'm currently working on Megaman 1 and Megaman 2. Though Megaman 1 is getting my attention at the moment. If you don't know, I do a handful of 'nes2pce' games. I take NES games and make them run on the PC-Engine (Turbografx in the US). Soome are cart projects and some are CD projects (the system is famous for its CD format). How it works: the original nes code runs on the PCE processor since it's 99% backwards compatible. None of the video/sound/mapper hardware is compatible, so I replace all LDA/STA etc opcodes that read/write ports - with JSRs (since the opcode is the same length). This jumps the processor to some backend code that converts this data into PCE hardware specific stuff. Via backend emulation, I emulate the PPU, APU, and mapper stuff. The PCE's processor runs at 7.16mhz vs NES 1.79mhz. So the game code runs four times as fast (but still timed to 60hz vblank, so the game itself runs at a normal speed). Even with the backend emulation being done on the same processor (processing overhead), the games still run faster than the original nes system. Thus, no slowdown. From there, I can hack the ever living crap out of the game. I can hack in PCE specific upgrades; more colors(4bpp vs 2bpp), more subpalettes (32 vs 8), larger sprites(16x16/32x32 vs 8x8/8x16), more tile/sprite cells, reduce flicker, upgrade the sound to better PCE PCM or use redbook audio (and ADPCM channel for sampled sound FX). Etc. That kind of stuff. I have a few intermediate things as well. I've upgraded the PPU emulation; unused bits in the sprite table entries can directly access PCE video related functions. I.e. I can add small upgrades without breaking the original game code too much (I can use it as baby steps). I currently have Megaman 1 running with PSG sound FX and red book audio tracks (CDDA/CD audio/etc whatever you want to call it). Anyway, I want to build upon the MM1 game engine. Expand its capabilities, so that I can just bring in other assets from the other Megaman games. One engine to rule them all - basically. And yes, this stuff runs on the real hardware as well (not just emulation). So this is thee 8bit Megaman hacking thread? Anyone know of a MM wiki for all this hacking info? Let me be the first to welcome you. Second, the best thing I can think of, currently, would be the Megaman pages from datacrystal. You might be able to find something there. Thanks. Hmm, doesn't seem to have anymore than what I've collected so far - from docs/sites. Zynk, if you want to look for Palettes or palette hex numbers for any weapon including for charged shots, use the FCEU's PPU viewer which is located at Debug. The bottom row of the 1st 4 bytes is Mega Man's weapon palette. What I want to know is which offset controls the palettes for the Atomic Fire colors. but after changing the color of Atomic Fire on that offset, whenever I shoot or charge that weapon, my edited color changes back to the original color. About Mega Man 2, does anyone know where Atomic Fire palette is located? I've changed the palettes for it. But whenever I shoot, Megaman's Atomic Fire palette reverts back to its original colors. Specifically, its Mega Man's helmet color. I know its located around offset 0003D310, but I still get the problem. Heatman's weapon had properties in array list. 3de46 - 3de48 : Sound IDs while charging, from small to full charge. 3de4b - 3de50 : Charging colors. 2 byte of color charging steps. EDIT: That was compatible with US version only. In Japan version, just substract the address by 3. 3de46 -> 3de43 and so on. Last view: 4 days Ok, through all my time as a member of Board 2 and being active in this thread, there's one thing that bugs me. You guys keep going on about ASM, but you never really give the details. Now, look. There may be a lot of people out there who want to make Megaman hacks like Pursebre, but frankly, chances are that won't happen. And you guys are probably tires of giving the same old speech, but stay with me. You get me all confused, or maybe the person your trying to help. Need be, give me a hex number so that I have something to work with. Now, I did some research, and learned that you need to reverse engineer in order to edit the ROM's ASM. Now, that's all you guys really have to say, and pretty much all confusion would be gone. NOW PLEASE! I'm not "yelling" at you because of this! Hell, I look to some of you as of Megaman hacks go. Now for a question... what type of program can I use that will allow me to reverse engineer a NES Rom? Fceux. The current build is 2.2.2. It has both a CDL (Code/Data logger, which is EXTREMELY useful) and a very nice trace logger. Set the trace logger to log to a file, set it to log only new code. Reset the system (via the menu, not closing the emulator) and play the game. You'll have to manually save the CDL file after playing/beating the game. It'll trace all new code as diassembly (along with some register info if you need it). It log all access to ROM as code or data. And for data, it will tell you how that data was access (directly, indirectly, etc). That's one step. The other step, is to use a debugger and manually step through the code to figure what things are doing. You can alternate between looking at the game in action, in the debugger and looking at the Trace log. Edit: While you're tracing and logging dissassembly and CDL stuffs, you can use savestates just fine. It won't effect the trace log either, since it only writes new code. CDL stuff doesn't matter because redundant access isn't a problem. Actually, you'll want to use savestates because you're logging the game while playing it - so you want the game to 'do everything possible'; die, fall on spikes, run out of energy, use different weapons, continue, stage select, etc. Fceux has a percentage meter too, so you know how much of the rom is left (unmapped). Slow mo and fast forward also work fine with the trace and cdl logger. Last view: 4 days So, thanks to tomaitheous for giving me insight for ASM, I mine as well kill two birds with one stone. I use the Code Data Logger to log the code when I fight the boss and I let them go through there pattern, and them stop the logging. I use Megaman 5's data crystal page to find the bank where I think the Boss's code would be. Am I doing something right? Is this what some of you guys would do if you were trying to find the boss's pattern, or something of the sort? Last view: 4 hours I have another question. Is it possible to add extra colors for Megaman on the Get Weapon screen? I know the Weapon colors are at offsets 0003D314-0003D341, this has all individual Item-1, Item-2 and Item-3 colors. Changing the hexadecimals on those will have different colors for each Item. However, on the Get Weapon screen (^pic), Megaman only has one color for all Items. The offset for that is at 00037F6A-00037F7D (US version)/00037DDB-00037DEE (JP version). Last view: 69 days I have a Question. In Megaman 4 how do I make it where If I want to make the screen scroll a different direction. Example: Lets say in a level I have to go up the ladder to the next screen but I want to instead drop down to another screen below. I have a Question. In Megaman 4 how do I make it where If I want to make the screen scroll a different direction. Example: Lets say in a level I have to go up the ladder to the next screen but I want to instead drop down to another screen below. Depends on what editor you use. But it has something to do with the scrolling. Last view: 4 days Hello again, I'm back. 1. Like before, I would like to know the exact hex positions of MegaMan's colors. Manually searching for them by searching for the color values is tedious and can lead to errors very fast. I also would like to know the exact hex positions of MegaMan's color in the Weapon Get Screen. 3. How can I make it like that so MagnetMan and SparkMan switch positions in the Stage Select screen? I already made it like that, so SparkMan's Doc Robot Stage loads up the Magnet Man Stage graphics instead. 4. I also would still like to have a NSF music portation tutorial, like for dummies, because I have composed some tracks, but I'm clueless about how to actually add it. I'm mainly concerned about music, which replace an old track, but is longer then the old track. The tutorial by za909 might work, but I still need to study it a bit more. In other news, I also decided to do what DHI didn't and actually COMPLETE RockMan Unprecendented. However, the current MM2 editor I have (the japanese one) doesn't let me screw around with enemy graphic tables like MegaFleX does (causing game restarts in random places when re-designing the third Wily Stage), so I would like to know, if there exist a better MM2 editor out there or if there exist a way to deal with the enemy graphic tables in MM2, which does NOT include searching for hex values. Again, thanks in advance! the weapons for pause menu can be edited in megafle, but this guide above will show where the Get Weapon's are. There's no one location for Megaman's colors. They all seem to depend on the level. I know that manually searching for his colors is tedious, but I think he's the only one with that specific palette. "Just using the hex editor" doesn't work, as I found out the hard way. You need to load a .TBL file containing the palette addresses for each letter in the hex editor. There are tutorials that show you how to do it yourself. There should be a "save to NSF" option in the File menu. 1. There's no one location for Megaman's colors. They all seem to depend on the level. I know that manually searching for his colors is tedious, but I think he's the only one with that specific palette. 2. "Just using the hex editor" doesn't work, as I found out the hard way. 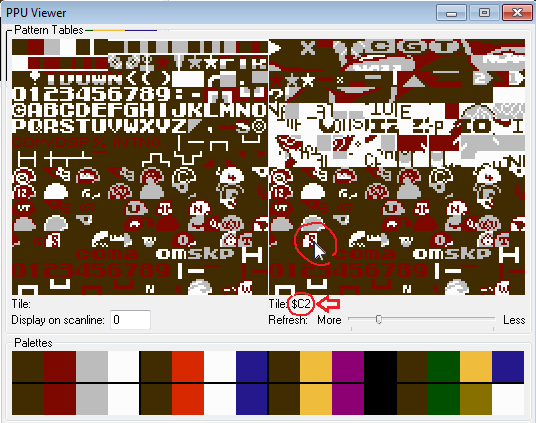 You need to load a .TBL file containing the palette addresses for each letter in the hex editor. There are tutorials that show you how to do it yourself. 5. There should be a "save to NSF" option in the File menu. 1. Oh boy, I guess I will just have to deal with it then...oh well. 2. TBL files? palette addresses for each letter? I'm starting to get confused. Is changing text in MegaMan 3 really that complicated? 5. Okay, I found it, but now, FamiTracker is asking me, whenever the NSF should NTCS, PAL, or Dual...what option should I choose? 3. I haven't found, what I need there yet, but does it also say, how I can make it like that, so clicking the mugshot, where SparkMan originally was, makes SparkMan appear in the Boss Introduction screen and makes SparkMan's stage load instead of MagnetMan? No, it really isn't that complicated. SMB3 is actually more difficult. I'm sending you a link for the Megaman 3 text table. Just copy all of that - except maybe the "invisible" and just use a lowercase r for "r.", paste it in a simple text editor and save it as .TBL file, and you have a .TBL file right there. A little word of warning, though. Do not make your text longer than what has been allotted for that text, unless you have a good grasp of pointers or something. NTCS, if it's a USA/Japan version, PAL if European. I don't know what Dual will do, though. 2. Okay, now this is, where the problem lies: the new text is longer then the old text. I'm also not sure, if I have a good grasp at pointers. I do have the pointers for most things, I just don't even dare to touch them, in the fear that I could screw up something, and oh boy, I can screw up things very easily. 5. Well, it is a MegaMan 3 ROM with Kuja Killer's improvement patch, so I guess it is NTSC? Last view: 2 hours yes, ntsc, that's the main common thing most games are in the world. dont pick PAL, because pal games only run at 50 FPS, and NES sound is slightly different, and slower compared to "60 fps ntsc"
MySQL - queries: 106, rows: 147/0, time: 0.134 seconds.